A quintessential British Element recommended for the success for all formal functions. Royal Occasions, Banquets, Balls and Dinners, Civic Ceremonies, Presentations, Burns and Ladies Festivals, Bar Mitzvahs and Weddings of all societies and cultures. Graham, professionally trained, has substantial experience officiating at prestigious functions and weddings of different cultures. 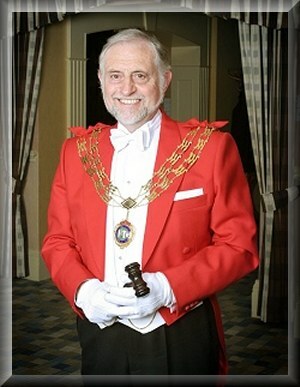 He is presently the President of the Institute and Past President of the FPT and the AUKSPT, each organisation dedicated to and diligent in maintaining and improving standards of the toastmaster. He is adept at ensuring your function proceeds smoothly, efficiently according to clients' requirement with the essential added ingredient of style.